Adam Lambert, Nominated For a Grammy! The music industry is beginning to put its head on straight as Adam Lambert was nominated for a Grammy for Best Male Pop Vocal Performance for his recording of Whattaya Want From Me, as announced last night! Other nominees in this category include: Michael Bublé (Haven’t Met You Yet), Michael Jackson (This Is It), Bruno Mars (Just the Way You Are) and John Mayer (Half of My Heart). Kudos to For Your Entertainment’s Rob Cavallo and Dr. Luke, as they were also nominated for Grammys for “Producer of the Year, Non-Classical.” In addition to producing other recordings, Rob Cavallo was nominated for producing Music Again, Soaked, Sure Fire Winners and Time for Miracles and Dr. Luke was nominated for producing title-track For Your Entertainment. Click here for the full list. After being curiously omitted from nominations for both the AMAs and the People’s Choice Awards, Adam’s fans are filling the tweet boards with “congratulations.” Adam also took to Twitter to make the announcement: Woah!!! Just got the news! A Grammy nomination?!?! I’m floored and honored. There are no words…. Congratulations Adam! Your fans around the world are standing up and cheering for you! 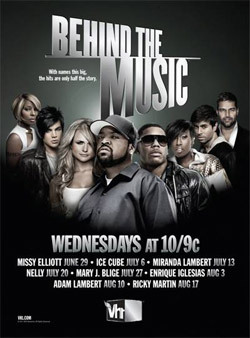 VH1’s most celebrated music documentary series “Behind The Music” returns with seven of today’s most successful and celebrated artists. The five-time Emmy® Award-nominated series gives viewers a front row seat to the most exclusive and intimate interviews with the artists as well as their families, friends and colleagues. Featured this season are Missy Elliott, Ice Cube, Miranda Lambert, Mary J. Blige, Enrique Iglesias, Adam Lambert, and Ricky Martin. The series will bring viewers never-before-seen footage of these talented musicians and the people who know them best. During Adams episode airing on Wednesday August 10th, you will witness never-before-seen home video footage, interviews with family, friends, industry experts and musical luminaries including Barry Weiss and “American Idol” Season 8 winner Kris Allen. Adam also gives us a sneak peak into the studio while working on his second studio album. Be there to hear what he has to say about his next work of art. This is not to be missed and will remind us all, why we fell in love with this pop music powerhouse. 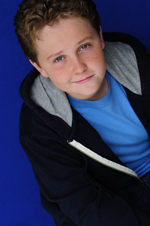 "My start with the BBYT team led by the talented Director, Lynne Broyles, was as an orphan in "Oliver". "Annie, Grease and the Wiz" were among my favorite Musicals. Through Lynne's voice & acting classes I learned the skills and discipline to perform for any audience. Lynne Broyles has the insight to focus on training; so the final stage production inspires not only the audience but also the performer." Jacob Hays, another Sam Steel Movie! Our story begins with the disappearance of the Crystal Chalice - a priceless Russian treasure dating back to the era of Peter the Great - in the early days of the Bolshevik Revolution. Hidden in the Soviet Union for many decades, the Crystal Chalice is smuggled by a personal valet into the United States during a visit by the Soviet Premier in the late 1950s. Jump ahead to present day, when Sam Steele Jr. (Jacob Hays) is assigned a book report on the Premier's visit. His lack of interest takes a 180 degree turn when antique store owner Ms. Jenkins (Dee Wallace) tells him the story of the Crystal Chalice. Unknown to Sam, an undercover Russian agent and a gang of treasure hunters led by Cash (Kevin Sorbo) are also pursuing the Crystal Chalice. 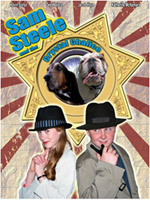 It is up to the Junior Detective Agency - Sam, Emma and Doug the Dog- to find the treasure before it falls into the wrong hands.